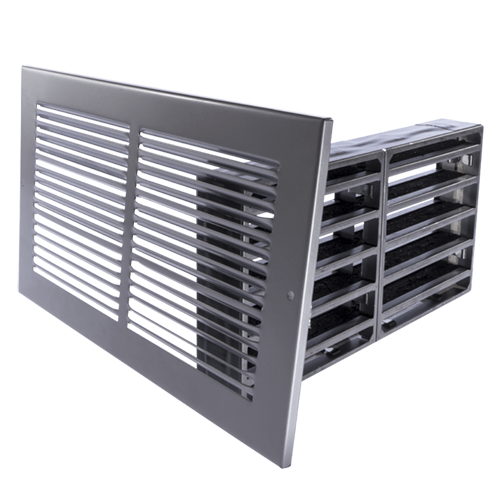 Pyroplex® Limited offers a comprehensive range of Fire Rated Air Transfer Grille Systems that are suitable for use in fire resisting doorsets for up to 60 minutes fire resistance. 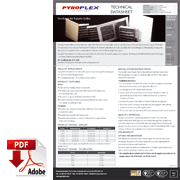 Pyroplex® Fire Rated Air Transfer Grille Systems are tested for 30 and 60 minutes fire resistance. Test Reports No.146520/146521 and 148053 apply – combined within Assessment Report No.149511. 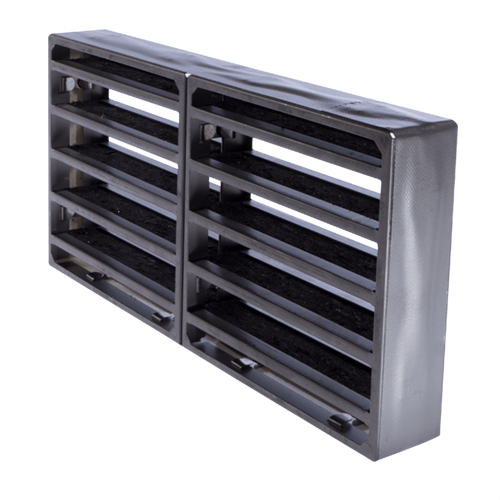 Faceplates are constructed from Zintec Mild Steel [1.0mm thick] and powder coated. Faceplates are supplied with fixing screws. Faceplates are available in a choice of two powder coated finishes – white and silver. Fire resisting doorsets – 30 minutes and 60 minutes. *Calculation is based upon overall grille dimensions and distance between product veins. 1. Cut the aperture in the door [The system shall be installed no closer than 150mm to the threshold and no higher than 1850mm]. 2. Line the aperture with a 6mm hardwood liner. 3. 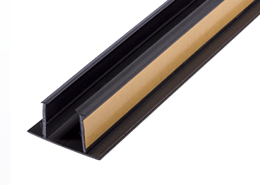 Apply a bead of Pyroplex® Intumescent Acrylic Sealant centrally and spread the acrylic across the full width of timber liner, to achieve a thickness of 0.5mm. 4. 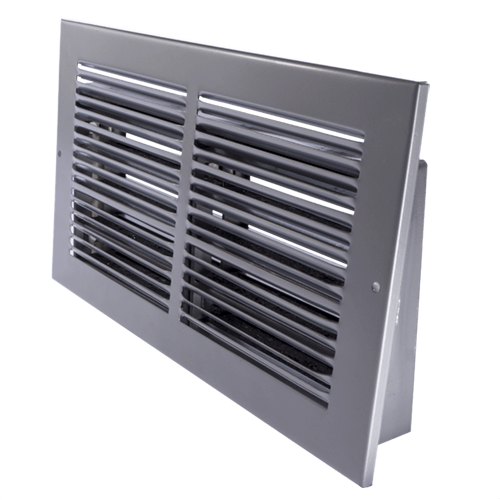 Install the Pyroplex® Fire Rated Air Transfer Grille into the aperture. 5. Secure the system into place using steel pins [not supplied]. Alternatively, secure the system using self-tapping screws. 6. Fit the cover plates on both faces of the door and secure with screws provided. 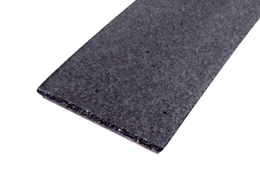 Independently tested by Warringtonfire for 30 and 60 minutes fire resistance. The system has been tested for positive and negative pressure planes, satisfying integrity performance for 30 and 60 minutes. Test Report No.146520/146521 and 148053 apply – combined within Assessment Report No.149511. 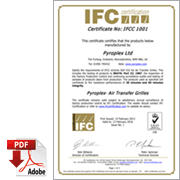 IFCC1001 accreditation applies.